I’ve been meaning to recommend Michel Blomgren and his site Bushcraft.se for a while. Not only is he very knowledgeable about the skills that will keep you comfortably alive should you get lost while in the forest, but he’s also a talented TV presenter who is not afraid to suffer, if it means imparting some knowledge. 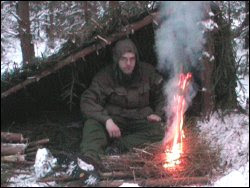 If you do nothing else make sure you watch Episode 1 - Five points survival. It could save you life, it will make an overnight stay in the woods more comfortable, and if you are trying to get your kids into the outdoors the skills he demonstrates are so simple you could be teaching them to your kids by this weekend. Genius!